What a sight! 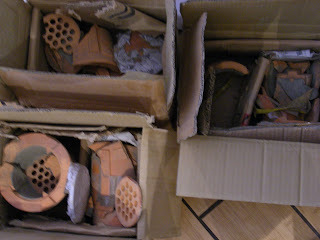 Boxes of broken pieces of my latest shipment of Chao Zhou stoves. I am going to find a way to patch them to a point where it's functional, cosmetic is not part of my concern at this point. 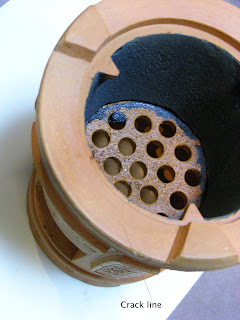 Does any one know how to repair terra cotta? 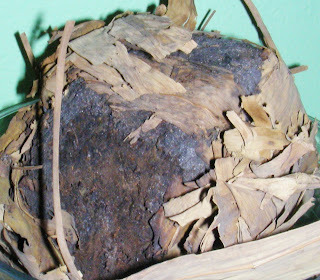 Glue might not be an option, since glue may not endure the heat from burning charcoal. Any type of clay or concrete? I was told raw egg white might work. Sweet rice (sticky rice) has long been used in building as a form of ancient concrete adhering bricks together. Some of the structure are still standing after over 800 years in parts of China. Perhaps I'll try mixing cooked sweet rice with raw egg white, blend them into a paste to glue the pieces together. A cracked stove with a broken leg, middle portion is also loose although functional. It does not wabble even 80% of one leg is chipped off. I am very much disappointed after I clean it out. Although this stove is standing and functional, expansion and contraction from heating then cooling off will eventually break it apart. I placed 2 wires around the top and bottom to secure it from falling apart in case the cracks got worse. It's heart breaking to wait many many days, weeks and months, everything shattered as they arrive. I am determent to put them back on their feet again. 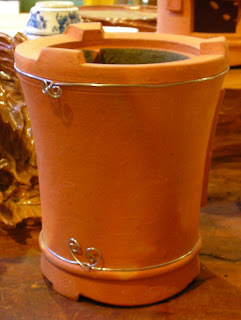 Terra Cotta is made of soft clay fired at low temperature. 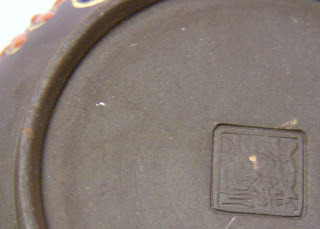 Life expectancy of such clay ware is temporally. They are extremely easy to break. What contributed to this disastrous shipment is mainly poor wrapping, long period of sailing is also a culprit, boxing everything into one heavy load spells trouble. One would drop a heavy package fast and hard, right?! Aish, Oy, Aiya! 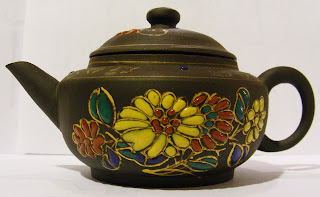 Hand thrown Chao Zhou pot from the 70's, made of local Zhu Ni (not Yixing Zhu Ni) with Fen Cai decor. 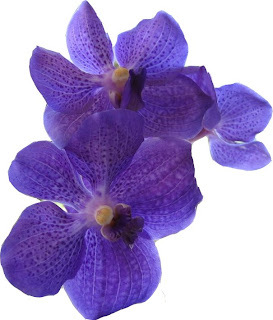 The dark purple color comes from high fire. 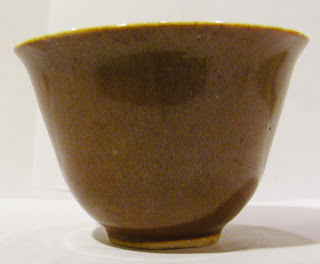 It's very heavy with thick wall, unlike the usual light weight thin walled red color Chao Zhou pots. 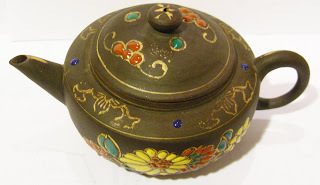 It's made by Lao An Shun, one of the 2 most famous hand thrown Chao Zhou pot makers. 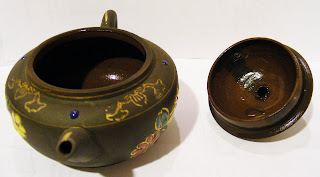 This style of tea pot is made similar to Yixing pots for export purpose. 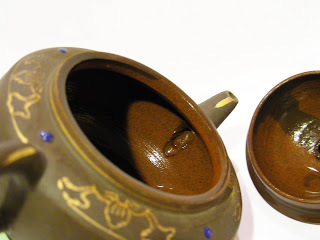 Exterior is glazed with finely ground Zhu Ni to give a smoother and darker color to look even more like an Yixing pot. 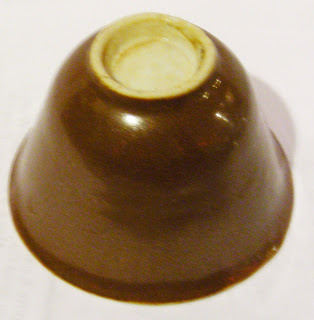 Single hole spout, no visible flaws or damage. Fen Cai(Soft Color or Pastel Color) was transcended from the Chinese 5 color Ying Cai (Hard color) with influence of French Enamel. 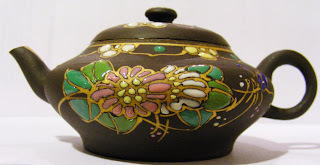 Ying Cai was the main coloring agent for pottery painting in Ming dynasty originating from Song and Yuan dynasties, mainly done under glaze. 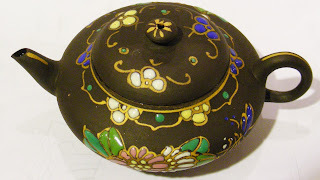 French Enamel was introduced to China in early Ching during Kang Xi years. Fen Cai began in Yong Zheng (son of Kang Xi) years. 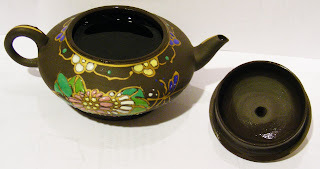 Adding a white glass glaze mixture to Ying Cai gives a softer look and it's applied on top of glazed potteries. The colors are more vivid, brush strokes are cleaner as a result. The finished art work also appears 3 dimensional. Same color inside and out. 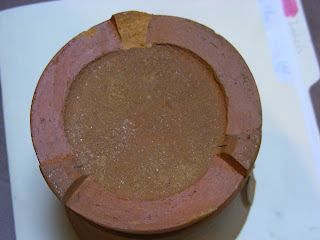 A crack at the bottom of the handle, result of shrinkage from firing. 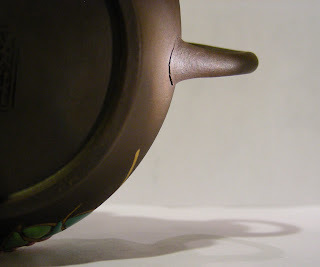 Crack lines on sides of the spout, visible on one side, a tiny line on the other side, also results of shrinkage from firing. Does not leak. I am dumbfounded! The shipment came in today, I was excited with reservation for a while until I opened the big box. Then I saw a LOT of dust everywhere out side of the small boxes, my heart sank a little more each time I pick up a box and hear noises of broken pieces. Out of 6 sets, only TWO, only TWO survived! Aaaaaaaaaah! This is absurd! The shipment of Stove sets are still not here, I am getting frustrated at the uncertainty of its arrival. Few tea heads made reservations and I can't promise them the stock. It's not very good business practice. I apologize for the inconvenience. This is a gift from my tea master, a basket of 70's Liu Bao. I asked for a small sample and he gave me a generous basket in whole. He's the best! Along with teas came over a week ago, there are a few surprises in the box. 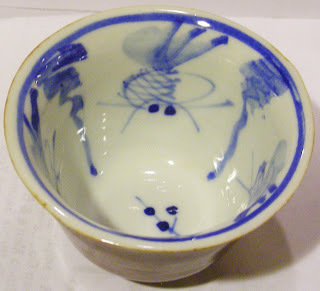 4 Ching Guang Xu year cups. It's brown glazed outside, blue hand paintings inside. 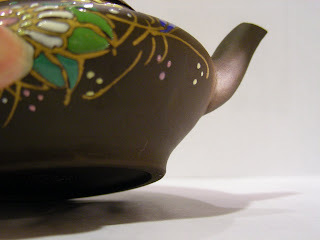 Yes, it does make tea taste better, smoother and sweeter. 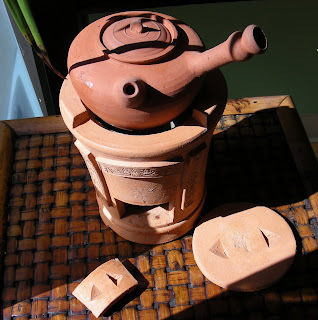 Not sure why, thought some say the initial firing (Huo Qi) is cured after such long period of time, thus capable of rounding off the edge of tea. 1) Designed new packages, meeting with manufacturers for production issues. Sample box arrived today and looking good. Also designed a bunch of fliers, post cards and business related documents. 2) YWCA Boutique sale for charity fund raising. 3) Of course Thanks Giving dinner with family. 4) Preparing holiday sales with gift packaging. 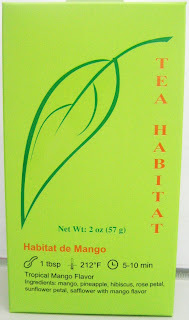 5) New teas arrived last week, a 13 teas tasting over the weekend was a nice break from work while at work. Still waiting for my stove sets after 2 months. I am extremely delighted that a professor from my University came across the country to join the tea tasting with his family while visiting local family. 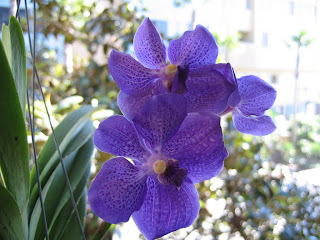 I am very proud and touched, it reminded me of my college years and I felt the reconnection of youth and worry free life after years of hussle and bussel in LA. 6) Supposed to work on translating the Book of Phoenix Dan Cong, so far I only finished the introduction. Not very productive on this matter. 8) My next big task is to conquer E-commerce web design!!! While waiting for 12,000 boxes to arrive. I'll be buried again once they arrive. 9) Added a new line of product to the store "Bee's Family" Honey, Raw unprocessed honey from Hong Kong, including some of the unusual flavors: Lichi(lychee) flower honey, Longan(Long Yan) flower honey<--- my favorite, Winter honey - multiple wild flowers. Well, that's enough to keep my head spinning even when I sleep.